The mountain fire near George. Eight people have died in the Southern Cape fires as crews battle to get the blazes under control. The fires have devastated areas near George and Knysna. "I can confirm it's eight deaths - two women, six children. The eldest of the children was 12. One of the women was pregnant," Captain Malcolm Poje, Southern Cape SAPS Communication Officer, told News24 on Tuesday morning. He said that evacuation efforts were ongoing as there were two separate fires. "The current situation is such we are evacuating residents in the line of fire in Rheenendal. The fire has spread to Rheenendal and in George it's been contained." 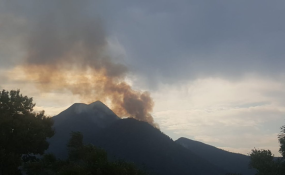 Poje said that gusts of wind and adverse weather conditions have made fighting the fire difficult for the crews in Knysna, but has aided the teams in George, who have managed to bring that fire under control. "There are flare-ups but we do have ground troops in terms of keeping a check on the fire," he said. Robinson Pass has been closed because a tree fell on the roadway, the Outeniqua Pass remains closed because of the fire and traffic from Beaufort West to Mossel Bay is being diverted via Worcester. "In Knysna and George the community centres have been made available for people," said Poje. He added that volunteers from as far as Bloemfontein have come to help fight the fires and there was strong motivation among the crews to bring the fires under control. Data from the South African Weather Service indicates a 60% chance of showers in Knysna and George on Tuesday which should assist firefighting efforts.